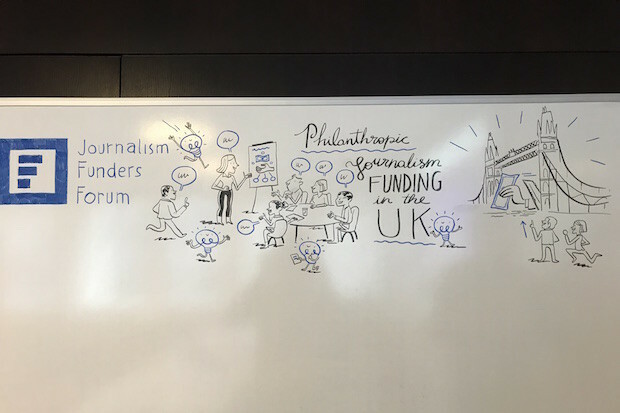 What are the challenges and opportunities of philanthropic journalism funding in the UK? "The landscape of philanthropic journalism funding is influenced by two inter-connected factors: the debates of 'what is journalism?' and 'who are journalists? ', and the fact that journalism per se is not recognised as a charitable purpose." Professor Jenny Harrow from the Centre for Charitable Giving and Philanthropy at Cass Business School, City, University of London, spoke at the Journalism Funders Forum in London yesterday (11 May), presenting some of the main findings from a new report commissioned in April by the European Journalism Centre. The report launched yesterday and will be available online next week. "There is an issue of journalistic norms and philanthropic norms not melding together," she said. "One of the biggest problems for foundations is not just giving the money but also withdrawing from the scene." reflections and recommendations based on the current "emerging and expanding" state of philanthropic journalism funding, the barriers of entry for new donors, and the various business models and revenue streams of prospective grantees. The latter could have a "particular appeal to funders pursuing social investment approaches, while presenting a barrier to others with more purely philanthropic approaches", Harrow and Pharoah wrote. The authors identified an annual estimate spending of around £30 million on journalism-related projects in the UK. The figure mainly accounts for 2015 and 2016 spending of philanthropic grant-makers on projects related to journalism and charities operating in news provision and journalism, which derive income from fundraising or charitable activities. The number excluded anonymous donations, individual giving and volunteer time. "What is not clear, however, is whether the framing of current philanthropic support for journalism is determined as much by the constraints of public benefit criteria as by donor preferences and needs on the ground," they pointed out. Harrow and Pharoah suggested that organisations looking for financial support should establish if philanthropic funding is the most adequate for the work they are doing, and acknowledge there will be some guidelines funders expect them to comply with. At the same time, there should be more guidance for organisations providing the funds in terms of how and where they should contribute to bring the most value. "More attention should be paid to the emerging opportunities to address digital exclusion through making grants for the extension and expansion of digital communications technologies to digitally-excluded and voiceless individuals and communities, such as young and elderly carers, or people with special needs or disabilities, or living in geographically isolated or deprived areas," highlighted the report.